Possible problems ahead for wildlife carers? 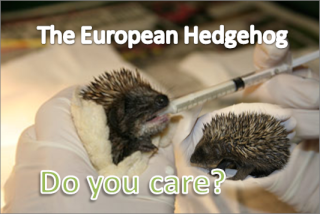 I've just been chatting with one of the people who runs The Hedgehog Helpline, the hog charity I am a carer for, and she gave me a heads up on some possible legislation that may come in shortly and which would affect all unqualified, volunteer wildlife carers. Apparently, the new legislation may state that only trained and qualified carers will be able to administer treatment and medications to wildlife. How certain this is yet is still in question but it could pose lots of questions and problems to thousands of voluntary, unqualified wildlife carers throughout the country. I'm lucky in that I work with a very supportive vet who tries never to have to put a wild animal down unless it is a lost cause. The vet is also happy for me to go along and complete a Veterinary Nursing certificate with his practice to give me the qualification needed to treat and administer medications to wildlife myself if needed. But I wonder how many other carers will be this lucky and how many just won't be able to continue offering the depth of help they currently do. Lots of wildlife carers don't just feed their charges and provide a safe bed for them because so many vets charge for looking after wildlife. Many get advice and initial treatment for the animal and then continue to administer the treatment themselves, as you would for a pet cat or dog, and only take the animal back to the vets if it takes a turn for the worst. I don't know anymore than the brief details I've been given this afternoon but I am a little worried. I just wondered if anyone else had heard anything about this?? Re: Possible problems ahead for wildlife carers? Thank you for posting this, something we all need to be aware of and look out for - I for one hadn't heard of it though may read about it while I am on another forum I am a member of. My vet is good, provide me with medication and treatment, I would like to take it further and maybe do a course like you mention but money and time contsraints are what stop me.